Waste management is the handling of discarded materials. The term most commonly applies to the disposition of solid wastes, which is often described as solid waste management. One form of waste management involves the elimination of undesirable waste products by methods such as landfilling and incineration. But recycling and composting, which transform waste into useful products, also are forms of waste management. The term waste can apply to a wide variety of materials, including discarded food, leaves, newspapers, bottles, construction debris, chemicals from a factory, candy wrappers, disposable diapers, and radioactive materials. Civilization has always produced waste. But as industry and technology have evolved and the world's population has grown, waste management has become an increasingly difficult and complex problem. A primary objective of waste management today is to protect the public and the environment from potential harmful effects of waste. Some waste materials are normally safe but can be hazardous if not managed properly. One gallon (3.75 liters) of used motor oil, for example, can contaminate one million gallons (3,750,000 liters) of water. Who manages waste? Every individual, business, and industry must make decisions and take some responsibility regarding its own waste. On a larger scale, government agencies at the local, state, and federal levels enact and enforce waste management regulations. These agencies also educate the public about proper waste management. In addition, local government agencies may provide disposal or recycling services themselves, or they may hire private companies to perform those functions. Most solid wastes can be subdivided into one of three major categories: municipal solid wastes; agricultural, mining, and industrial wastes; and hazardous wastes. Municipal solid waste is what most people think of as garbage, refuse, or trash. It is generated by households, businesses (other than heavy industry), and institutions such as schools and hospitals. Biosolids: Another name for sewage sludge. Cremators: Primitive devices for incinerating municipal wastes. Dump (or open dump): An area in which wastes are simply deposited and left to rot or decay. Hazardous wastes: Wastes that are poisonous, flammable, or corrosive, or that react with other substances in a dangerous way. Incineration: The burning of solid waste as a disposal method. Landfilling: A land disposal method for solid waste in which garbage is covered every day with several inches of soil. Leachate: The liquid that filters through a dump or landfill. Recycling: The use of waste materials, also known as secondary materials or recyclables, to produce new products. Resource recovery plant: An incinerator that uses energy produced by the burning of solid wastes for some useful purpose. Source reduction: Reduction in the quantity or the toxicity of material used for a product or packaging; a form of waste prevention. Tailings: Piles of mine wastes. Waste prevention: A waste management method that involves preventing waste from being created, or reducing waste. Waste-to-energy plant: An incinerator that uses energy produced by the burning of solid wastes for some useful purpose. Although we may be very conscious of municipal wastes, they actually represent only a small fraction of all solid wastes produced annually. Indeed, more than 95 percent of the 4.5 billion tons of solid waste generated in the United States each year come from agriculture, mining, and industry. These forms of solid waste are less visible to the ordinary person because they are usually generated at remote mining sites or in the fields. Mining nearly always generates substantial waste, whether the material being mined is coal, clay, sand, gravel, building stone, or metallic ore. Early mining techniques concentrated on the removal of ores with the highest concentration of the desired mineral. Because modern methods of mining are more efficient, they can extract the desired minerals from veins that are less rich. However, much more waste is produced in the process. Many of the plant and animal wastes generated by agriculture remain in the fields or rangelands. These wastes can be beneficial because they return nutrients to the soil. But modern techniques of raising large numbers of animals in small areas generate great volumes of animal waste, or manure. Waste in such quantities must be managed carefully, or it can contaminate groundwater or surface water. Hazardous wastes are materials considered harmful or potentially harmful to human health or the environment. Wastes may be deemed hazardous because they are poisonous, flammable, or corrosive, or because they react with other substances in a dangerous way. 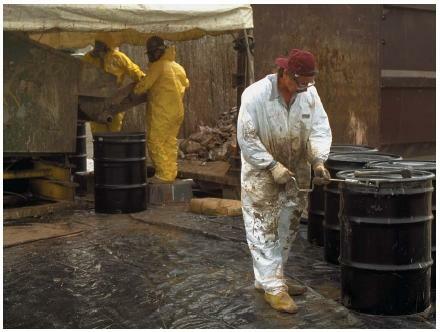 Industrial operations have produced large quantities of hazardous waste for hundreds of years. Some hazardous wastes, such as mercury and dioxins, may be released as gases. Many hazardous industrial wastes are in liquid form. One of the greatest risks is that these wastes will contaminate water supplies. substances. When these substances react with the oxygen in the air, toxic acids may form and may be washed into the groundwater by rain. Hazardous wastes come from the home as well. Many common household products contain toxic chemicals. Examples include drain cleaner, pesticides, glue, paint, paint thinner, air freshener, and nail polish. Twenty years ago, most people dumped these products in the garbage, even if the containers were not empty. But local governments do not want them in the garbage. They also do not want residents to pour leftover household chemicals down the drain, since municipal sewage treatment plants are not well-equipped to remove them. Throughout history, four basic methods for managing wastes have been used: dumping; incineration (burning); recycling; and waste prevention. How these four methods are utilized depends on the kind of wastes being managed. Municipal solid waste is much different than industrial, agricultural, or mining waste. And hazardous waste poses such serious problems that it needs to be handled by specialized techniques, even when it is generated with other types of wastes. Landfills. Early humans did not worry much about waste management. They simply left their garbage where it dropped. But as permanent communities developed, people began to place their waste in designated dumping areas. The use of such open dumps for garbage is still common in some parts of the world. But open dumps have major disadvantages, especially in heavily populated areas. Toxic chemicals can filter down through a dump and contaminate groundwater. (The liquid that filters through a dump or land-fill—just as water percolates or filters through coffee grounds to make coffee—is called leachate.) Dumps also may generate methane, an explosive gas produced when organic wastes decompose under certain conditions. In many parts of the world today, open dumps have been replaced by landfills, also known as sanitary landfills. The sanitary landfill was apparently invented in England in the 1920s. At a landfill, garbage is covered at the end of every day with several inches of soil. Landfilling became common in the United States in the 1940s. By the late 1950s, it was the dominant solid waste disposal method in the nation. Early landfills had significant leachate and methane problems. But those have largely been resolved at landfills built in the past 20 years. Today's landfills are lined with several feet of clay and with thick plastic sheets. Leachate is collected at the bottom, drained through pipes, and processed. Methane gas also is safely piped out of the landfill. The dumping of waste does not take place on land only. Ocean dumping makes use of barges that carry garbage out to sea. This technique was once used as a disposal method by some U.S. coastal cities and is still practiced by some nations. Sewage sludge, or processed sewage, was dumped at sea in huge quantities by New York City until 1992, when it was finally prohibited. Also called biosolids, sewage sludge is not generally considered solid waste but is sometimes composted with organic municipal solid waste. Incineration. Incineration has a long history in municipal solid waste management. Some American cities began to burn their garbage in the late nineteenth century in devices called cremators. These devices were not very efficient, however, and cities eventually went back to dumping or other methods. In the 1930s and 1940s, many cities built new types of garbage burners known as incinerators. Many incinerators have now been shut down, primarily because of the air pollution they create. Waste burning enjoyed yet another revival in the 1970s and 1980s. The new incinerators, many of which are still in operation, are called resource recovery or waste-to-energy plants. In addition to burning garbage, they produce heat or electricity that is used in nearby buildings or residences or sold to a utility. Many local governments became interested in waste-to-energy plants following the U.S. energy crisis in 1973. But, by the mid-1980s, it had become difficult to find locations to build these facilities, once again mainly because of air quality issues. Another problem with incineration is that it generates ash, which must be landfilled. Incinerators usually reduce the volume of garbage by 70 to 90 percent. The rest comes out as ash that often contains high concentrations of toxic substances. Recycling and waste prevention. Municipal solid waste will probably always be landfilled or burned to some extent. 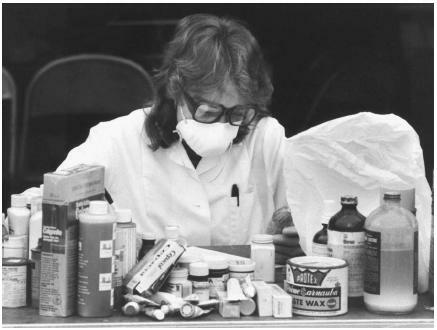 Since the mid-1970s, however, nondisposal methods such as waste prevention and recycling have become more popular. Because of public concerns and the high costs of landfilling and incineration, local governments want to reduce the amount of waste that needs to be disposed. Even the earliest civilizations recycled some items before they became garbage. Broken pottery was often ground up and used to make new pottery, for example. Recycling has taken many forms. One unusual type of recycling, called reduction, was common in large U.S. cities from about 1900 to 1930. In reduction plants, wet garbage, dead horses, and other dead animals were cooked in large vats to produce grease and fertilizer. A more familiar, and certainly more appealing, type of recycling took place during World War II (1939–45), when scrap metal was collected to help the war effort. Modern-day recycling has had two recent booms, from about 1969 to 1974 and another that began in the late 1980s. At the beginning of the twenty-first century, the recycling rate in the United States had risen to 28 percent, an increase of more than 10 percent from a decade before. Reuse and repair are the earliest forms of waste prevention, which also is known as waste reduction. When tools, clothes, and other necessities were scarce, people naturally repaired them again and again. When they were beyond repair, people found other uses for them. One form of waste prevention, called source reduction, is a reduction in the quantity or the toxicity of the material used for a product or packaging. Industrial wastes that are not hazardous have traditionally been sent to landfills or incinerators. The rising cost of disposal has prompted many companies to seek alternative methods for handling these wastes. Often, a manufacturing plant can reclaim certain waste materials by feeding them back into the production process. An estimated 60 percent of all hazardous industrial waste in the United States is disposed of with a method called deep well injection. With this technique, liquid wastes are injected into a well located in a type of rock formation that keeps the waste isolated from groundwater and surface water. Other underground burial methods are also used for hazardous industrial waste and other types of dangerous waste. Hazardous wastes are disposed of at specially designed landfills and incinerators. A controversial issue in international relations is the export of hazardous waste, usually from industrial countries to developing nations. This export often takes place with the stated intent of recycling, but some of the wastes end up being dumped. I;m Hiwot from Ethiopia. I really appritiate this article and I have learnt a lot from it.Would you please send me other article that can teach me a lot about the current status and impact of industrial west in the woled. I am an Environmental Officer at a Mining company in Zambia, Central Africa. Through our many operations we are generating a considerable amount of used oil and grease, can anyone please advise on how to best dispose of it? And if incinaration of the grease with copper or pyrite concentrates is environmentally friendly? Good and is encouraging, but tell me more about renewable gas. Thank you very much. Your information was clearly stated and not mixed up which made it easier for me to read and understand. I am realy appreciate your work to make me more aware about the pollution and could you send me some information on the coffee waste management specially on wet and dry processing wastes. Its simple,summarized and concise to waste management.Its a masterpiece collection. i realize that our wastes is pollute our environment.maybe we sometimes not to throw our garbage everywhere.